Priding itself in the representation of physicians and hospitals in the defense of medical malpractice claims, Gerolamo, McNulty, Divis & Lewbart, P.C. 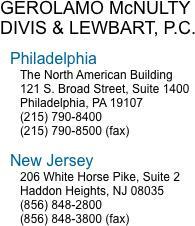 is well recognized and respected as one of the premier medical malpractice defense firms in the city of Philadelphia. Each and every medical malpractice client is given individualized attention throughout the process from inception of the claim through final resolution, whether through settlement, dismissal or jury verdict. The numerous forensic experts at our disposal allow us to give our doctors and hospitals complete and thorough representation.